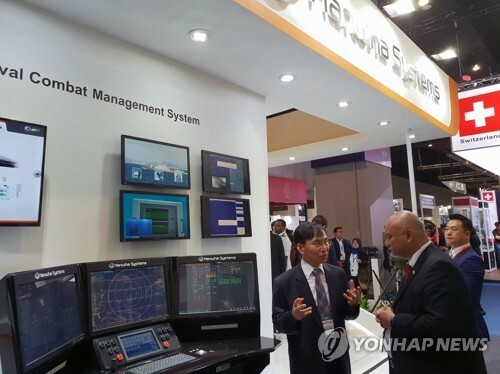 Hanwha Systems said it has unveiled its shipboard combat system and integrated surveillance patrol solution at the Defence Services Asia 2018 that kicked off in Kuala Lumpur, Malaysia on Monday. More than 1,000 companies from 60 nations, including Korea’s 24 firms, have participated in the Asia’s largest defense procurement exhibition this year. Hanwha Systems said it would focus on the marketing activities of its shipboard combat system that was mounted on Korean navy’s key vessels for 30 years. Shipboard combat system serves a role of linking and integrating various voyage auxiliary equipment, including arms equipment and sensors. The firm will also promote its multi-function observation device, thermal observation device and network-based integrated surveillance patrol system at the exhibition. “We will focus on demonstrating Hanwha Systems’ global technology competitiveness in the areas of shipboard combat system and electronic optics,” said Chang Si-kweon, CEO of Hanwha Systems. Hanwha’s defense arm, Hanwha Defense Systems, also displayed its wheel type armored car, Tigon, which was newly developed for the regions of Asia and the Middle East.